What tests do health care professionals use to diagnose a torn ACL? What type of health care provider cares for ACL injuries? The purpose of the knee joint is to bend and straighten (flex and extend), allowing the body to change positions. The ability to bend at the knee makes activities like walking, running, jumping, standing, and sitting much easier and more efficient. In the acute situation, with a painful, swollen joint, the initial examination may be difficult because both the pain and the fluid limit the patient's ability to cooperate and relax the leg. Spasm of the quadriceps and hamstring muscles often can make it difficult to assess ACL stability. The anterior cruciate ligament can be reconstructed by an orthopedic surgeon using arthroscopic surgery. There are a variety of techniques, depending on the type of tear and what other injuries may be associated. The decision as to what surgical option is appropriate is individualized and tailored to a patient's specific situation. Because of its blood supply and other technical factors, the torn ACL ends are not usually sewn together and instead, a graft is used to replace the ACL. Often an autograft, tissue taken from the patient's own body, is a piece of hamstring or patellar tendon that is used to reconstruct the ACL. Research is ongoing about the potential role for biologic enhancements to the surgical repair, using stem cells, platelet-rich plasma, and growth factors to help promote healing and ligament regeneration. The diagnosis of an ACL tear may be made by emergency physicians, primary care providers, sports-medicine providers, and/or orthopedic surgeons. If no surgery is planned, the primary care provider or the orthopedic surgeon could direct care in association with a physical therapist. Anti-inflammatory medications, such as ibuprofen (Motrin, Advil), naproxen (Aleve), or ketorolac (Toradol), may be suggested to decrease swelling and pain. Narcotic medications for pain, such as codeine or hydrocodone (Vicodin, Lortab), may be prescribed for a short period of time after the acute injury and again after surgery. American Academy of Orthopedic Surgery. Management of Anterior Cruciate Ligament Injuries. Evidence-Based clinic Practice Guidelines, 1st Edition. September 2014. Buchholz, R.W., et al. Rockwood and Green's Fractures in Adults. 6th edition. Philadelphia: Lippincott, Williams and Wilkins, 2006. Gobbi, A., G.P. Whyte, and G. Karnatzikos. "Acute ACL Rupture: A Biological Approach Through Primary ACL Repair and Augmentation with Bone Marrow Stimulation and Growth Factor Injection." In: Nakamura, N., S. Zaffagnini, R. Marx, and V. Musahl (eds.) Controversies in the Technical Aspects of ACL Reconstruction. Berlin, Germany: Springer, 2017: 135-144. La Bella, C.R., et al. "Anterior Cruciate Ligament Injuries: Diagnosis, Treatment, and Prevention." Pediatrics 133 May 2014: 5. Uchida, R., et al. "Stem Cell-Based Therapy in Anterior Cruciate Ligament Repair." Ann Joint 2 (2017): 76. 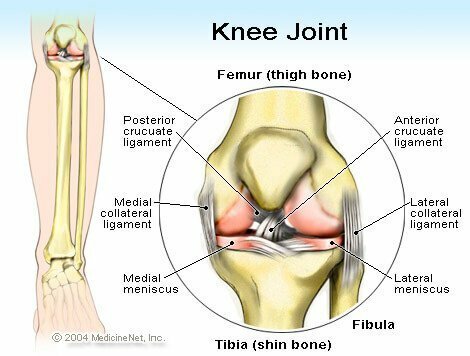 The medial collateral ligament (MCL) is one of four ligaments that stabilize the knee. MCL injuries are referred to as tears or sprains. Sprains are graded from 1-3 based on the severity of the injury. Symptoms and signs of MCL injuries include swelling, pain, stiffness, and limping. Treatment of MCL injuries may involve resting and bracing the affected knee, and physical therapy can help to restore the range of motion.